Craig Nelson • Scribner, 2014, 438 pp. If you’ve read and reread the history of a century of physics, the atom bomb, and quantum theory, you yawn at the prospect of plowing the same ground one more time. And then you open The Age of Radiance and read the personal history of the fascinating characters who discovered X-rays, created radium, the first artificial element, and began to cope with the myriad mysteries and far-reaching implications of the discovery of atomic energy. Witness: The loves of Madame Curie, previously cast as a cold-hearted woman of science, revealed as a passionate lover, heartsick when her beloved Pierre died beneath the wheel of a cart in Paris. If you don’t know math, it can be hard to appreciate genius in physics, but anecdote can substitute: When Fermi, alarmed by the rise of fascism in Italy, decided to emigrate to the United States in 1938, he applied for jobs at four universities. He was offered positions at five. 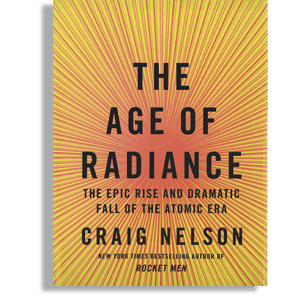 When author Craig Nelson switches from history to current affairs, he illuminates the 2011 Fukushima meltdown in Japan, caused by a giant tsunami that flooded emergency generators. Electrical failures elsewhere had caused some reactor authorities — but not the Japanese — to upgrade emergency power supplies to reactors. After a massive earthquake and tsunami darkened the six-reactor plant at Fukushima, employees scrounged the parking lot for car batteries in a futile effort to power the cooling pumps. When that failed, partial meltdowns at several reactors rubbed salt into the wounds of a tsunami that killed more than 15,000. “The continuing explosions; the fires erupting everywhere, the tsunami-scattered debris; the odor of dead sea life, of burning fuel rods, of over-worked and fearful and unwashed men. In all the Cold War fantasies about how the world will end in nuclear holocaust, no one imagined the details of a power plant run amok, an industrial utility collapsing in atomic chaos. … In the control room, people were saying we were finished,” one employee remembered. As the climate crisis deepens, some environmentalists are giving the thumbs up to nuclear power as an alternative to fossil fuels. They may be right, but Three Mile Island, Chernobyl and Fukushima all show how civilian nuclear stations can fail and ignite equal-opportunity disasters, even in highly organized, high-tech societies.